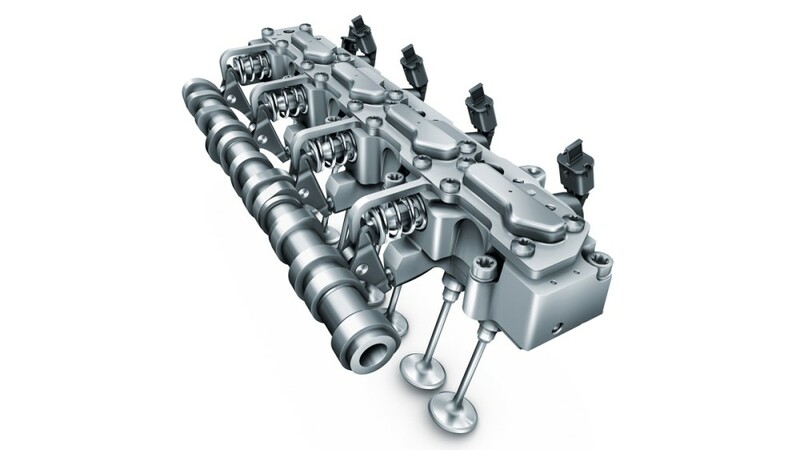 The world’s first fully-variable electro-hydraulic valve control system is currently being used in Alfa Romeo, Fiat, Chrysler and Jeep branded vehicles. Further brands will follow in the foreseeable future. Contributing also to the success story of the innovative UniAir technology is the win of the renowned Automotive News PACE Award in 2012. UniAir provides for the demand-based control of engine valves and allows almost any valve lift variation to be realized. The technology enables considerable reductions in consumption and emissions to be achieved, as well as a significant improvement in torque curves. UniAir offers an extended range of options for matching engine operation to specific situations and requirements including, for example, the implementation of modern combustion processes such as the Miller and Atkinson cycles. Cylinder deactivation is also possible without additional engineering outlay. Thus, three-cylinder engines can be operated using rolling cylinder deactivation, meaning that each cylinder is switched off in turn. A key advantage of this is that the deactivated cylinder does not cool down so that optimum results can be achieved in terms of fuel efficiency and emission reduction. With a three-cylinder engine, this intelligent deactivation solution leads to fuel-saving, quasi “1.5-cylinder” operation. Schaeffler expertise in the area of transmissions also helps in this regard as far as vibrations are concerned, as it ensures a high level of driving comfort even with this unique mode of operation.